If you&#039;re a woman in your premenopause or perimenopause years, you probably thought you were long past the threat of pimples. Think again: A significant minority of women suffer from acne during the years before they stop menstruating for good. As almost always in acne, shifting hormones drive zit development. Fortunately for you, dermatologists offer treatments that can curb acne in your years before menopause. Male hormones called androgens&mdash;male-type hormones such as testosterone&mdash;drive production of the skin oil that helps to cause acne, according to the Cleveland Clinic. Once your skin has too much oil present, you can develop clogged pores and infection from bacteria. Teenagers get pimples because their hormones shift and surge, and women in perimenopause experience similar types of hormonal shifts that can lead to overproduction of oil in their skin. You can still get acne in perimenopause even if your hormones are at normal levels. Women who develop perimenopausal acne likely will turn first to acne medicines available without a prescription. According to the American Academy of Dermatology, look for products that are formulated especially for adult women, since they will tend to dry your skin less. 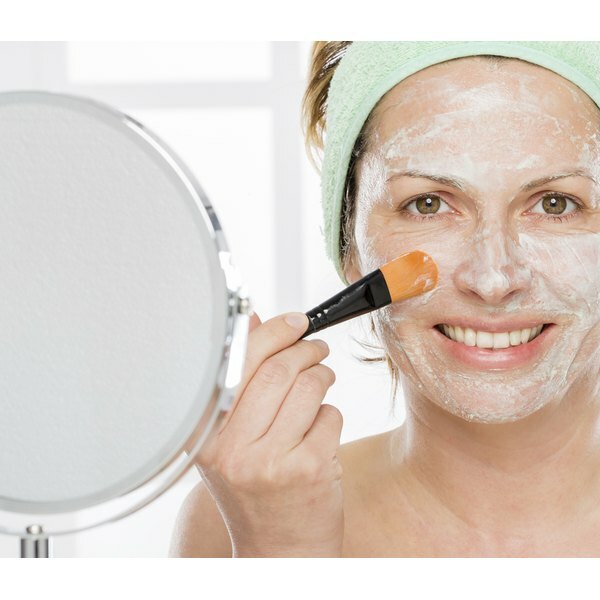 Cosmetics manufacturers also target adult women with acne-fighting foundations and other cosmetics, which often contain acne-fighting ingredients like salicylic acid. Since perimenopausal acne often resists over-the-counter treatments, you may need to see a dermatologist, especially if your breakouts are particularly bad. Your dermatologist may prescribe antibiotics, either in oral or topical form. These medications will fight the bacteria that cause acne-related infection and inflamed pimples. You might also consider topical treatment involving retinoids, which are compounds derived from vitamin A. Retinoids can help to clear the oil from your pores, and also will rejuvenate your skin, erasing tiny lines in the process, according to the AAD. Acne in premenopause likely will abate once your hormones settle down, but to get it under control before that happens, you may need to take a hormonal medication to level out your hormones and prevent them from driving your acne. Dermatologists use several different types of hormonal medications to treat acne in adult women, according to DocGuide.com. Oral contraceptive pills can effectively curb breakouts, but may not be appropriate for women older than 35. Hormone replacement therapy also can stop zits from forming, but your dermatologist or ob-gyn may reserve that for women who have other menopausal symptoms, such as mood swings or insomnia. Even if you&#039;ve never experienced acne before, you might find your skin breaking out during premenopause due to the normal hormonal fluctuations present at that time of your life. Regardless of what treatment you choose, it&#039;s important to continue a careful skin care routine, according to the AAD. Acne worsens when your skin gets irritated, so use a cleanser that&#039;s gentle on the skin, avoid scrubs and, above all, never pick at existing pimples, because that can cause worse infection.